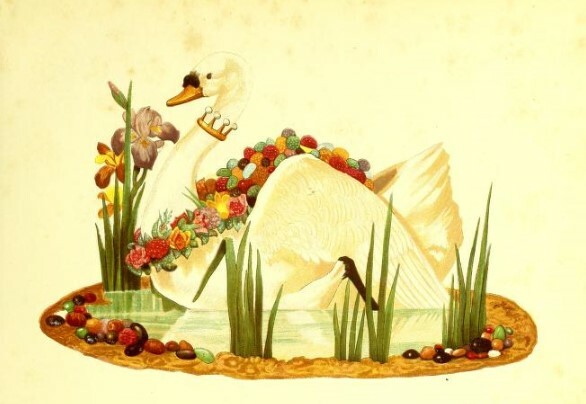 The illustration depicts a demure creature, floating on a pond, encircled with a baked shore lined with rocks made of candy. She is indeed ‘laden’ with sweets, and her garland of candied flowers and tiny neck crown ensure that she is dressed for the most elegant table. 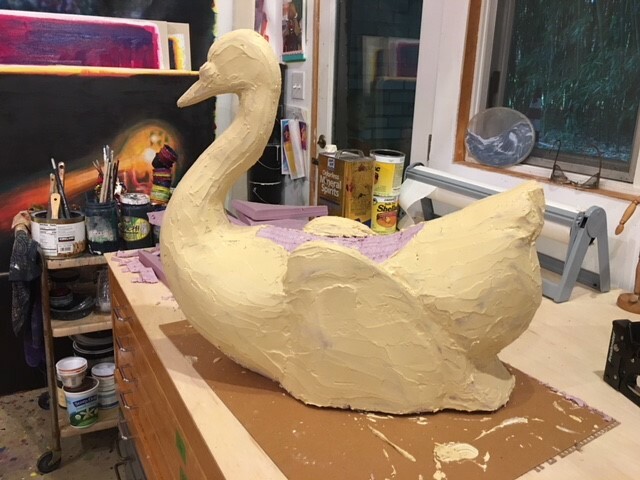 The greatest challenge with creating this faux food has come from the irony of sculpting a swan that is supposed to look like a cake, not a swan! 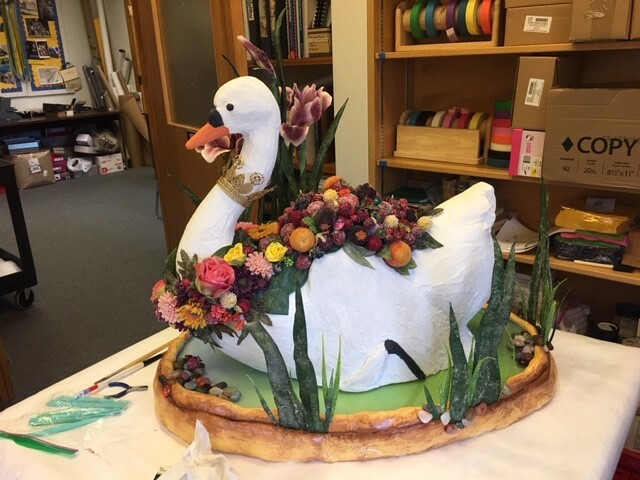 The sweetmeats, sugared berries, candies, and candied flowers were not hard to imagine, but the swan needed to reflect the struggles that even the most talented baker would have faced with sculpting cake into fowl, all finished with ‘sugar-icing’ that is conservation-approved for the Winterthur collection! Last spring, artist Lance Winn and I set to work with Catherine Westbrook, research and collections assistant, to conceive the making of the creature. Lance began with the illustration. 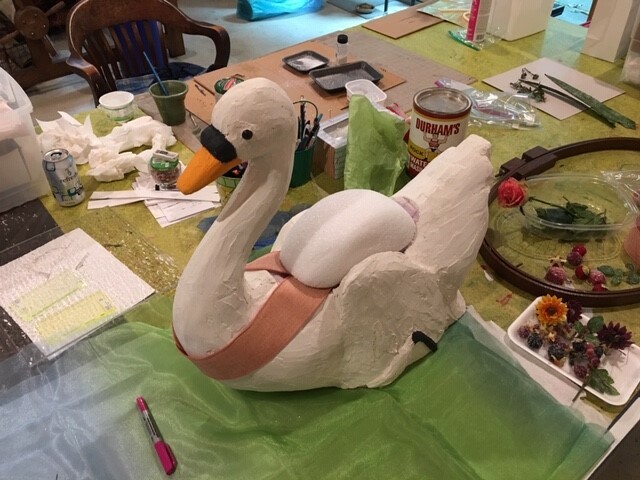 From a scan of the image, he created a rough 3-D model that allowed him to cut layers out of foam to create the swan form. Once Odette’s shape was achieved, we turned to our kitchen drawers to find the right tools for applying her first layer of wood-putty icing. A nice, flat offset spatula and a putty knife did the trick. 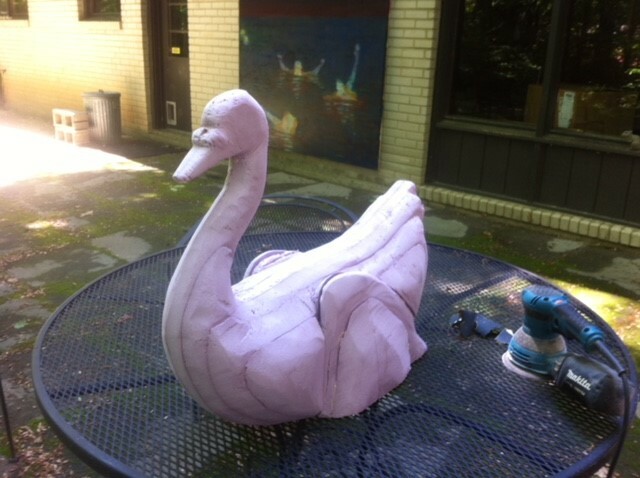 A few more layers of icing and some sanding, a dense coat of ivory-white paint, and Odette looked good enough to eat. It was time to fill her with ‘sweetmeats’ and dress her for the party. 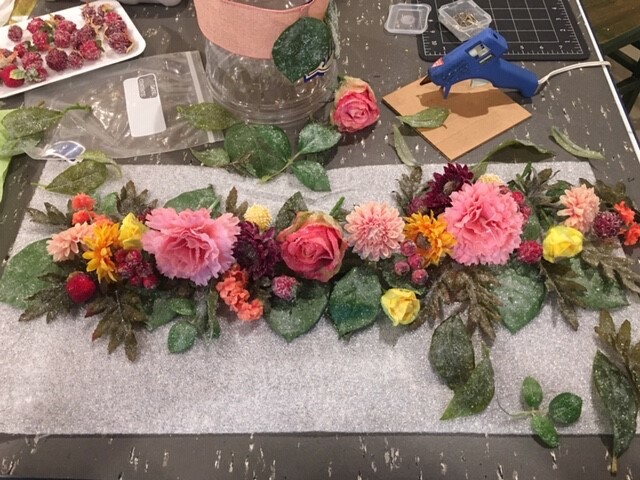 Hundreds of flowers, berries, and leaves were carefully ‘sugar’-coated with glitter and glass. Mathew Stiles’s thoughtful guidance inspired a plan that would secure tall plant life in Odette’s pond. 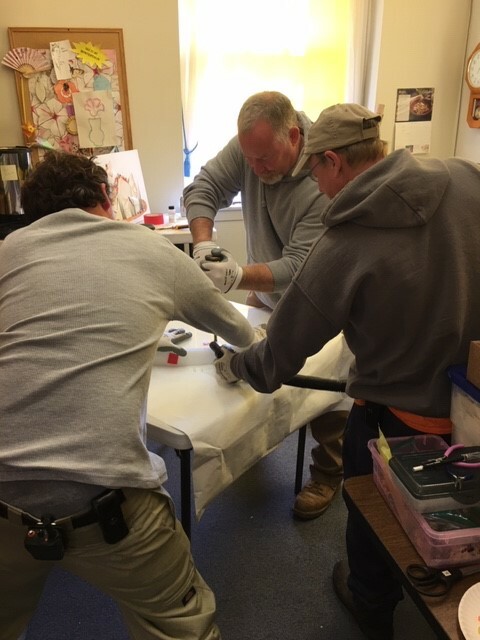 Benny Terranova, Carl Borden, and Terry Herd arrived with tools in hand to perform the operation. With the vacuum running, three holes were carefully drilled through the plexiglass and ethafoam base. Chiffon was layered under the plexiglass, and the spinach jelly came to life. A rustic crust was sculpted, and rocks imported from Colorado—yes, real rocks that look like candy made to look like rocks—were placed along the shoreline with the ‘angelica’ bulrush leaves and ‘candied’ iris. A tiny crown was found and gently secured around the swan’s neck. She was months in the making. In that time, many of us wondered whether a swan cake had ever truly been made? Served? Eaten? We might never know, but surely a creature as lovely as Odette should only be food for thought … or for Winterthur’s Yuletide! You can see Odette in the China Hall during the Yuletide Tour at Winterthur. This entry was posted in Uncategorized, Yuletide and tagged Christmas, dining by design, Winterthur Museum Garden & Library, Yuletide, Yuletide at Winterthur. Bookmark the permalink.